A Johns Hopkins University-based research team found that infusing mosquitoes' microbiomes with a microbe called Chromobacterium sp. (Csp_P) had a few powerful effects on the disease-carrying insects. First, the Csp_P killed a large number of mosquitoes. In the mosquitoes that survived, researchers found that the bugs' immune systems kicked into gear to weaken the pathogens making their hosts' bites less likely to transmit malaria or dengue. 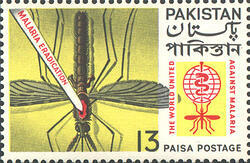 They also found that Csp_P itself often killed the malaria parasite and the dengue virus in mosquitoes that survived. Researchers cultured the Csp_P in blood samples and sugar water and envision that it could be added to insecticide traps that are designed to lure mosquitoes that then spread the insecticide in their colonies. The one-two punch approach would kill most mosquitoes and seriously curtail the survivors' ability to infect humans with malaria and dengue. There is also hope that Csp_P could be used as a malaria or dengue treatment for humans that are already infected since the microbe killed, or at worst, made inert, the pathogens in mosquitoes. "Tanjore Balganesh, a medicinal chemist who heads the Indian Open Source Drug Discovery program in Bangalore for neglected diseases such as malaria and tuberculosis, is skeptical, however. Because Csp_P is so toxic to Plasmodium, the dengue virus, and even the mosquito that carries them, there is a good chance it could be damaging to human cells, too, he says. That’s not a death blow for this line of inquiry, however. “It’s still early days [for this research],” he says, “but no drug discovery program is without problems.”"
Someday, perhaps, no more malaria. For more posts on vaccines on Up at 5AM, click here.